Three new engines are set to bolster the UK S-Class line up to a total of 11 different models. The S 300 BlueTEC Hybrid L AMG Line, S 600 L AMG Line and S 65 AMG L will be available from April 2014 production, extending the range to now include the first diesel hybrid engine in the segment with class-leading economy, through to the ultimate in refinement, power and performance in the form of the S 65 AMG. The S 300 BlueTEC Hybrid L AMG Line is the second engine for the S-Class Hybrid offering (alongside the S 400 Hybrid L), and is from the same engine family as the successful E 300 BlueTEC Hybrid, with a 2.2 litre, four-cylinder diesel engine joined by a 27 hp electric motor. 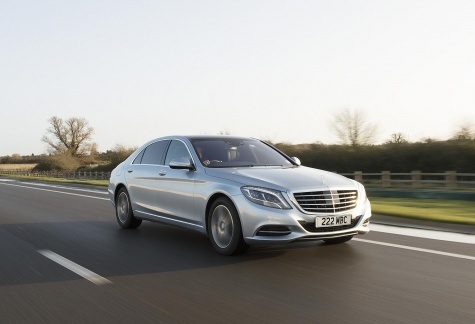 With a combined fuel consumption of 61.4 mpg and CO2 from 120g/km, the S 300 BlueTEC Hybrid sets a new efficiency benchmark in the segment and is available from £72,260 OTR. In addition, standard equipment across the entire S-Class range, including the S 300 BlueTEC Hybrid, from March 2014 features an innovative touchpad system that allows control of COMAND Online using single or multiple-finger gestures, and new optional features include the new Head-up Display, which provides the driver with key information at a glance without having to take their eyes off the road, and heated windscreen. For the two V12 models, the S 600 L AMG Line and the S 65 AMG L, they represent the ultimate levels of standard equipment. Key features include: Executive Rear Package and Rear Seat Reclining Package for backrest adjustment to 43.5 degrees; Rear Seat Comfort Package including Rear Seat Entertainment; Front Seat Comfort Package; Exclusive nappa Leather Package; Burmester 3D High End Surround Sound system; and Keyless-Go Package to include remote boot closing and hands-free access. In fact, only a few selectable options remain for the 12-cylinder models besides the paint, upholstery and trim choices, including the Individual Rear Seats Package (£2,900) and a refrigerated compartment behind the rear armrest (£1,130). The S 600 L AMG Line, priced from £139,960 OTR offers a 13 hp increase over the previous S 600 model to 530 hp, with 830 Nm of torque, accelerating from 0 to 62 mph in 4.6 seconds. Emissions are reduced by 21 per cent to 259 g/km with a 27 per cent improvement in combined fuel consumption to 25.5 mpg. The impressive figures continue with the S 65 AMG L, which is priced from £179,960 OTR. The 630 hp and 1,000 Nm of torque help to propel the S 65 AMG L from 0 to 62 mph in 4.3 seconds – a 0.1 second improvement over the previous S 65 AMG L. In addition, there is a 16 per cent decrease in CO2 emissions to 279 g/km and a 20 per cent improvement in combined fuel consumption to 23.7 mpg.